You’ve helped us raise £340 for Project Waterfall through the sale of our Espresso Cheesecake Brownie – and we still have 8 months to go! The money raised is helping Project Waterfall bring sustainable, clean drinking water and sanitation to schools across Uganda, Kenya and Ethiopia. This kind of project is life changing for the people involved, so thank you for helping us contribute to this amazing cause. 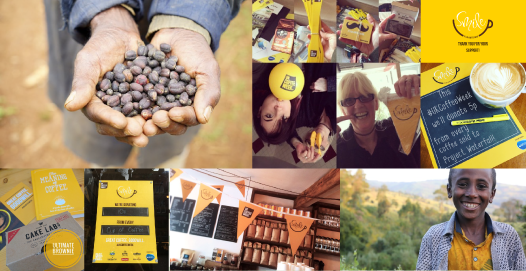 Did you take part in UK Coffee Week? Send us some pictures of what you got up to and we’ll share them on Twitter. UK Coffee Week was the biggest one yet this year, with over 4000 coffee shops taking part across the country. Activities included fundraising gems such as latte art throwdown, coffee crawls and guess the origin of the coffee bean. The fundraising crown (so far) has gone to Timberyard UK who raised over £1800 with their ‘Darlings of Ethiopia’ campaign - focusing on the children in orphanages across Ethiopia who have benefited from clean water and sanitation projects carried out by Project Waterfall and Splash International. Let’s see if we can continue this great work by smashing our £1000 fundraising target by the end of the year. Buy our Espresso Cheesecake Brownie.